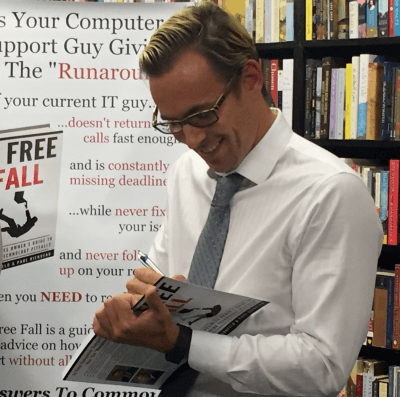 Why Read “IT Free Fall“? 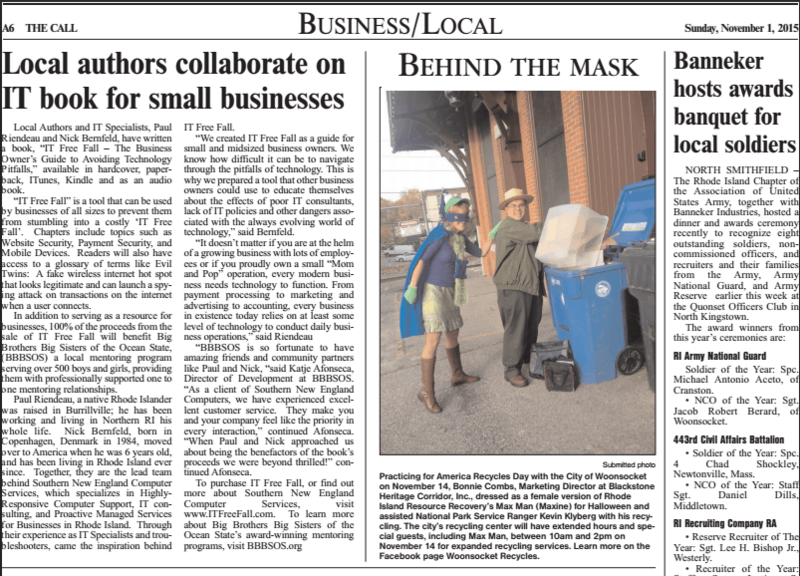 We created IT Free Fall as a guide for Small and Mid-Sized Business owners. We know how difficult it can be to navigate through the pitfalls of technology. This is why we prepared a tool that other business owners could use to educate themselves about the effects of poor IT consultants, lack of IT policies and other dangers associated with the always evolving world of technology. Listed as top 100 Best Seller Ranking in Outsourcing! Why: To Support #GivingTuesday where up to 20% of ALL Purchases Go Directly to Big Brothers Big Sisters of the Ocean State! Why: 100% of ALL Proceeds Go Directly to Big Brothers Big Sisters of the Ocean State! 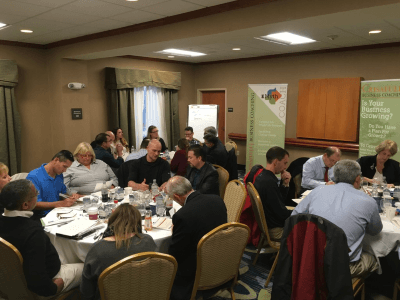 On November 12th, Nick and Paul attended the eMyth Business workshop at the Hampton Inn of Smithfield. There was a great energy among all the attendees which was made up from business owners all over the Northeast. Jim Crisafulli was a terrific speaker and together with him and his team of coaches, they lead a productive and insightful workshop. Everyone left there with a clear plan and goal for their business in 2016. IT Free Fall is available in various formats, please choose what will work best for you! Who is IT Free Fall For? It doesn’t matter if you are at the helm of a growing business with lots of employees or if you proudly own a small “Mom and Pop” operation, every modern business needs technology to function. From payment processing to marketing and advertising to accounting, every business in existence today relies on at least some level of technology to conduct daily business operations. 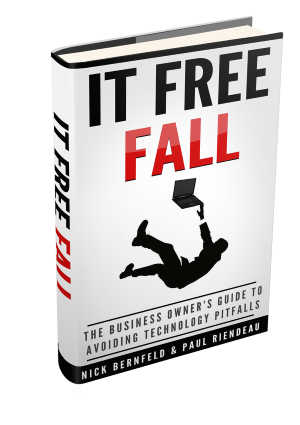 This book is designed for businesses of all sizes to prevent them from stumbling into an IT Free Fall. Paul Riendeau was born in Rhode Island in 1967. 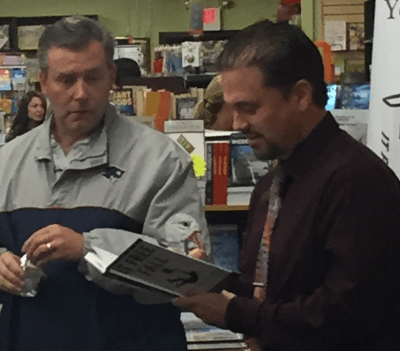 Raised in Burrillville, he has been working and living in Northern RI his whole life. Paul is a born leader, and has been managing a staff his entire career. 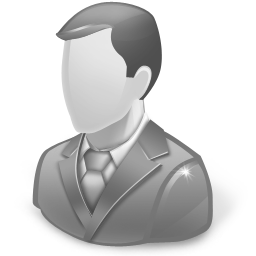 Paul’s direct, no BS attitude quickly creates a level of trust with all of his friends and clients. When someone is in need of his help, he will stop at nothing to make sure that person is taken care of. Once he takes on a project, he will work tirelessly to ensure that it is seen through to completion. In the summer time you can find Paul wake surfing on Echo Lake in RI. Nick Bernfeld was born in Copenhagen, Denmark in 1984. He moved over to America when he was 6 years old, and has been living in Rhode Island ever since. Nick brings a high level of energy and determination to his work. He loves all thing tech, and is always the first to get the latest gadget, whether it’s the latest iPhone or Microsoft Server software. He loves challenging himself to reach new heights, both mentally and physically. Such as going paragliding, kiteboarding, and heli-skiing. 8 Most Important IT Issues! See the Secret Issues you must be concerned about when it comes to IT Support! Quick Cheat Sheet of things your IT Provider needs to provide to you in their services! Acceptable Use Policy – A must in today’s society of smart phones and mobile internet access! Email Usage Policy – Stop personal use of business email! What to look for during your hiring process! Various policy templates, and why they’re important! Sign Up for Exclusive Insider Information! If you are interested, please sign up today to get the latest news about the release of IT Free Fall, as well as the Lite version of the Audio Book, Free! Thank you for reading IT Free Fall! 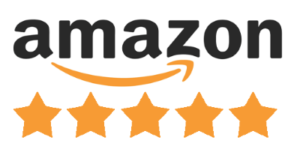 If you would like to submit a review, please enter it into the field below. We appreciate any feedback and we look forward to hearing from you. Have any questions, concerns, or comments? Please feel free to reach out to us! We appreciate any and all feedback.